The six-foot-long fish mounted over Roger Crandall’s desk certainly looks real. But in fact, this work of art, as he calls it, is a wood carving fashioned with the help of several dozen photographs of the 140-pound tarpon that Crandall hooked, battled for more than an hour and a half, landed, and then released off the Florida keys in 2006. Like just about everything else assuming floor, wall, and shelf space in Crandall’s large office at MassMutual, which he jokingly refers to as the hall of dinosaurs, the wood carving has meaning and tells a story — or several of them. In this case, the fish, which he admits probably wouldn’t fit anywhere else, relates his passion for the sport, which he enjoys for the challenge of fights like he had with the tarpon, but more for the relaxation it provides as well as the opportunity to get away from the numbers that have dominated his life and career. Moving around the room, one will find dozens of objects that speak volumes about Crandall’s work and the mindset he brings to it. For example, there’s the 107-year-old grandfather clock, presented as a gift to a former president of MassMutual by the general agents association. Still keeping good time, the clock is there as a reminder of the importance of the relationship between the company and its agents and general agents, he said. And then, there are the model planes, or what Crandall referred to as “deal toys.” There are more than a dozen of them in total, and they represent individual aircraft or airlines that MassMutual has owned or invested in over the decades, he explained, noting a few that he’s particularly proud of. One would be a model of a jet owned by Morris Air, a small outfit started by David Neeleman in Salt Lake City that caught Crandall’s attention when he was an analyst for MassMutual in the early ’90s. The company tripled its investment in Morris Air in just over 18 months when that venture was sold to Southwest Airlines, Crandall recalled, adding that the story got better — and the deal-toy collection grew significantly — when, after his non-compete agreement with Southwest expired, Neeleman started another airline that MassMutual became an original private equity investor in — JetBlue. “I think we made $80 million on a $15 million investment,” he said. Although it would outwardly appear that Crandall’s office is outfitted as a way to salute past achievements, he described it collectively as an inspiration for the future — the tense that certainly occupies most of his time and attention. 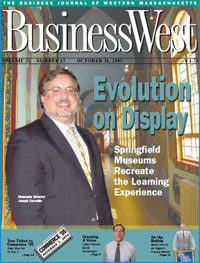 He told BusinessWest that he’s focused on the year 2040, for example. That’s the year the U.S. is expected to be a nonwhite majority, and while that’s 28 years away, he’s already taking steps to position the company for that time, with steps ranging from a comprehensive effort to change the demographic mix of the company’s roster of agents to the introduction of many new products, to aggressive marketing to target groups ranging from African Americans to gays and lesbians. For this issue, BusinessWest talked at length with Crandall about tarpon, investments in airlines, and company history — but mostly about the future and how he intends to position the 161-year-old company to be fully ready for it. 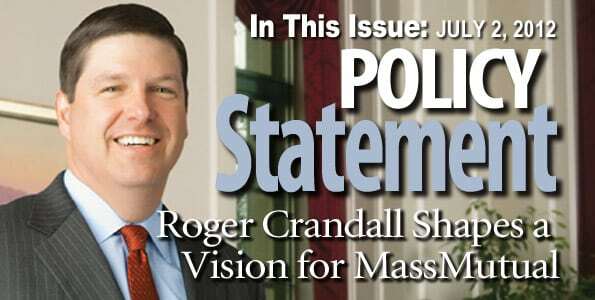 Crandall remembers that while he was in grade school, he would often go to the office on Saturdays with his father, a group life and health salesperson for MassMutual. “I would stuff envelopes for him so he could do mailings, and got a penny an envelope,” he said, adding that he eventually took on more far-reaching duties. Indeed, when personal computing came into prominence, he would use an early spreadsheet program called VisiCalc (which predated Lotus and Excel) to help his father show prospective clients how much the premiums would be for group life insurance. “Later, during summers when I was in college, I would go out on sales calls with him and sit in on meetings with MassMutual pension customers … that’s how I got a serious introduction to MassMutual,” he said, adding that while his father spent 34 years with the company, he didn’t picture himself following in those footsteps, let alone becoming CEO. However, a series of circumstances, starting with the economic landscape he encountered upon graduating from the University of Vermont with a bachelor’s degree in 1988, put him on course that eventually led to that office on the second floor of the company’s State Street headquarters. MassMutual gave him the opportunity to take the charter financial analysts exam, and he eventually moved from real estate to the investment division to the securities investment division, where, fortuitously for him, the analyst assigned to watch the airline industry had just retired. With a little guidance from his uncle, but mostly a keen eye for potential-laden ventures, Crandall steered MassMutual toward the Morris Air, JetBlue, and other deals now commemorated in his office. In 2000, he joined Babson Capital Management, LLCV, a MassMutual subsidiary, and in 2002 was named managing director of that company and head of its Corporate Bond Management, Public Bond Trading, and Institutional Fixed Income units. In 2005, he was appointed chairman of Babson Capital and executive vice president of chief investment officer of MassMutual, eventually becoming president and CEO in January of 2010, and later named chairman as well. He took those final steps to his current post at the height of the Great Recession, a downturn that severely tested all financial services institutions, but also brought a number of opportunities for MassMutual. “The company is much stronger today than it was at the end of 2007,” he explained. “Our sales are higher, our earnings are higher, and our capital is higher. It was Rahm Emanuel (President Obama’s former chief of staff) who said, ‘don’t let a good crisis go to waste,’ and from our perspective, it became a great opportunity to remind people about the strength of a mutual company and how we differ from a stock company. And by this he means the three main pillars of the company’s operations — providing customers with financial security, paying the best dividends, and providing exceptional customer service. For example, the company has “doubled down” on its roster of agents, going from 3,700 a few years ago to more than 5,000 today, he said, while also investing in new products, including a number of creative life insurance options, designed to meet the various needs of customers. Such steps are part of those aforementioned efforts to position MassMutual for both today (and those opportunities from the fiscal crisis Crandall described) and the much different look and feel that this country — and the world — will have two, three, and four decades from now. And with that, he turned to another item in his office, a framed commemorative photo, a gift from a Chinese entity that MassMutual has partnered with on a utility venture. And in a figurative sense, the puck is going to a place and time, not far off, and in some cases, already here, where the demographic picture will be much different. The company has responded in a number of ways, he said. “One of the big things we did was realize that the face of America is changing, and we needed a much more aggressive diversity strategy,” he explained. “So we’ve gone from having maybe 100 of our agents being multicultural to perhaps 1,000 over the past four years. Another component of the company’s ‘getting back to basics’ strategic initiative is using marketing and other vehicles to emphasize the inherent advantages from doing business with a mutual company, Crandall continued. “We’re owned by our policy holders, so we don’t get torn between two opposing views,” he explained. “Shareholders, we believe, are inherently, and rightly, more willing to take more risk than the policy holder is. Since we have just one constituency, we think that’s a huge advantage over having two, and you have to look no further than to a few public companies that are undergoing very sigfificant changes because their shareholders are pushing them to do that — their policy holders are not a big part of that public discussion. 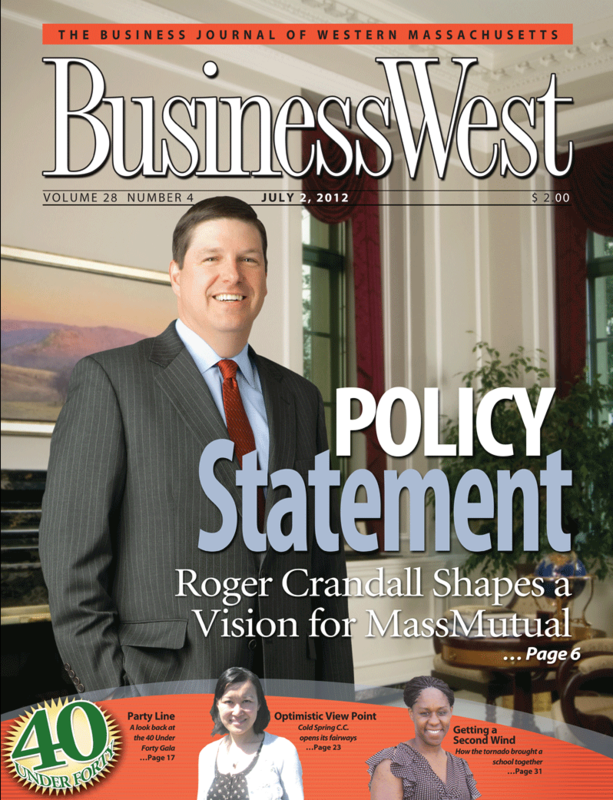 These various pieces, from investment in new products to bolstering and greatly diversifying the roster of agents, to more aggressive marketing have all helped the company, said Crandall, noting that in 2011, MassMutual set records for sales of whole life insurance products and retirement products, and ended the year with record capital. And those trends have continued into the first half of 2012. Looking ahead, he said there are tremendous opportunities to build on that recent progress, as evidenced by what many would describe as alarming statistics regarding Americans and how little they’ve done to secure a solid financial future. “There are 50 million Americans who don’t have any life insurance, and that’s a huge opportunity for us,” he explained, adding that this is one of the reasons why, in addition to taking market share from competitors, the company can grow simply from what will, or should be, a much larger pie. “The other huge opportunity stems from the fact that Americans simply haven’t been saving enough money for probably the past 25 years. Which brings him back to Albert Einstein and his comment on compound interest. Among the myriad artifacts in Crandall’s office is a photograph of himself with David Neeleman in front of a JetBlue plane at New York’s JFK Airport. Like the grandfather clock, framed insurance policy, and assorted deal toys, it is, as he said, a celebration of a past achievement, but also serves as inspiration for future success. And it’s yet another example, said MassMutual’s top executive, of how even a company with 160 years of history to look back on, can only succeed if both eyes are on the future — and especially the distant future.